AWP: How did your interest in wine unfold? CES: Everything starts with your family; my father drinks wine everyday (moderately!) and when I was of age to taste wine he initiated me. However, it was mostly during my studies that I developed a strong interest and passion in wine; at the Sorbonne I became President of the wine tasting club, and one of my teachers, Jean-Robert Pitte, a great wine writer and for once wine producer, was giving us amazing masterclasses. I then wanted to become like him! I have much respect for him. Later on, I set up wine tasting clubs in London, organized tastings there, in Paris, Washington D.C., Sao Paulo, New York City, Munich, Istanbul… Wine became the story of my life. AWP: A little over 12 years ago, you set out to observe and offer some of the best wine and food pairings behind the world’s most accomplished Champagnes, wines and spirits—whose sumptuous combinations with taste are as much art as gastronomy. What have you found? CES: Indeed we have had amazing pairings that transcend both food and wines. This is what I found fascinating: when you find the perfect match (which is as much the success of the chef as mine), there is an alchemy in your mouth that creates a whole new world of aromas and textures; not just the addition of the ones of the wine and the one of the food, but something new giving a higher pleasure. AWP: With Champagne, for example, in a recent wine and food pairing in Hong Kong, you were drawn to the simplest of sweets and savory combinations: jellies, jams and condiments with chilled bottles of the best French champagnes and sparkling wine. What was the effect that made these flavors, these tastes so inviting and pleasurable to the Chinese palate? Would these tastes be true to the Western palate as well? CES: It is very à la mode to pair Western wines with Asian food; it has been done a lot with Japanese cuisine, but there is also a whole continent of flavors to explore in the Chinese cuisine. So the pairings here are interesting, you can try the spicy cuisine of Sichuan with a great peppery Syrah from Côte Rôtie, or on the contrary with a sweet wine to balance the spiciness. There is only one rule: try matches, and try again. You may be surprised with some combinations you wouldn’t have thought about. Wine and gastronomy develop your curiosity! AWP: Which non-French cuisines are making an inroad into pairings with Champagne? CES: Japanese cuisine is offering a very interesting combination with Champagne, because of the delicacy of savors and the range of possible pairings. As an example, the acidity and saltiness of some extra-brut Blanc de Blancs Champagne is interesting to pair with raw fish (but forget about wasabi). AWP: What are the great traditional culinary pairings with Champagne? More seriously, this is simply a perfect match for many Champagnes, especially the ones with most Chardonnay (including the Blanc de Blancs that are 100% Chardonnay). Pinot Noir-based Champagne are stronger in flavor and texture and go perfectly on white meat or veal. Dry salty cheese like Parmigiano will be perfect with an extra brut or non dosé Champagne. Sweeter Champagne (with higher dosage) matches perfectly with fruity desserts. The possibilities are endless! And dinners serving only Champagne (3 to 5 different types) are a must-try. AWP: Are wine and food pairings best left to the professional chefs and Sommeliers or can we make some interesting and pleasing discoveries at home as a hobby? What is the simplest way to start? CES: Just give it a try. Be curious and audacious. Never let the professionals decide for you! There are just a few basic rules to respect (but remember rules are made to be broken): you walk on two legs, so strong aromas on one side require strong aromas on the other, otherwise you lose the weaker ones; proteins of meat call for tannins; very salty cheese like Roquefort match perfectly with sweet wines; start your dinner with light dry acidic wines and finish with tannic red wines then sweet wines; some foods are very difficult to match with any wine, like garlic, anchovies, asparagus, crudités, yoghourt, citrus fruits, mustard, vinegar, and too spicy food. AWP: What do you think today’s Sommeliers bring to the diner’s experience? CES: Most good restaurants have an impressive wine list; but how many people do know enough about wine to make a clear selection? It is a hard job to choose. So the sommelier is here to guide you according to the meal you want and/or the type of wine you would enjoy more at that time. Trust him/her but ask for the reasons of his/her choice, you will learn at the same time! AWP: What has influenced your own style of pairing wines and food? CES: What I pay the most attention to is not the aromas but the structure of the wine: is it balanced, can it age any longer? In the food, I pay mostly attention to the texture of it, and it helps me to find the right wine that has the right structure to fit this texture. AWP: How do you orchestrate wine from the aperitif through the meal to its final course? Are there some helpful hints that you’d like to share on this topic? CES: Never serve strong wines as an aperitif, like a sweet wine, a Port, or even worse: a whisky. This would kill your palate for the rest of the dinner. Start with Champagne or a light wine, white or red. The idea is to have a progression: you don’t drink a Malbec of Argentina before a Gevrey-Chambertin village. At the same time you also plan a progression in the complexity and age of the wines, so you usually serve the oldest and most refined ones at the end. For each dinner the order of service is a subject of discussion and arbitration. AWP: Do North Americans bring a different set of expectations to the wine experience than do the French? The Asians? The Italians? The Australians? CES: I love American tourists; they are always eager to learn, and always have plenty of questions about everything. They are demanding, but in a nice way; treat them well, show them the best of a vineyard or entertain them with a wonderful selection of wines, and they will be grateful. It is a pleasure to work for them. Each country, of course, has different expectations, but I would rather categorize people according to their curiosity and level of knowledge than by nationality. However, it is true that depending on where you come from you might in general have different levels of knowledge, and it happened to me to explain wine tasting to a group of Asian people who had almost never tasted wine, so you have to start from scratch. Any situation is challenging but you have to adapt to the clientele to satisfy them. AWP: Do the French have a different attitude toward what they drink? CES: French usually believe they know a lot about wine, just because they have so many opportunities to drink some. However I can tell you the average knowledge is not very high, and I have found many more knowledgeable people in Japan, the U.S. or the U.K. just to name a few. AWP: Minding our manners, sociability, conviviality—is there an art to conversation at the French table? CES: French people love to spend time at lunch or dinner, it is very important in social life. Therefore wine is also at the center of the conversation and people like to speak about it, tell their impressions about it. “And then?” Fouché added, a little puzzled. AWP: Drinking Champagne in France: are there unspoken rules? CES: No cup, just flute. And don’t open the bottle with a heavy “pop”; you should just hear a discrete breath. AWP: Your life has taken you from investment real estate banking for Goldman Sachs to Champagne Ambassador to France organizing premier wine and spirit tastings for international companies and consulting for producers and importers. What inspired you toward a life and career so dependent on taste and the ability to communicate? CES: Wine has been my passion for more than 12 years. I tried to resist it but couldn’t! So finally I fully work in the wine industry, as an entrepreneur, which was also an important motivation for my career change. And I love to teach people about wine tasting, wine history, wine geography, the marketing and business aspects of it, etc. It is a really interesting industry. Working in the wine business brings me peace, because I feel I can make a real difference and I am close to people: the producers, the industry leaders, and the consumers. It doesn’t bring as much money but is much more rewarding in what it brings to balance my life. CES: 150 km only from Champagne region! CES: Paris is my hometown even if I lived a few years abroad: London, New York, Istanbul. So I have a particular link to the city. What I love in Paris is the food it has to offer: fresh markets and caterers are everywhere, offering wonderful things to bring home and cook with your family or friends. One part of Paris I am particularly fond of is rue Mouffetard area in the 5th, my childhood neighborhood; there, you find so many traditional food shops, it is full of scents, especially on Sunday morning. I close my eyes, listen to the noise of the streets and the voice of merchants shouting their best deals, and open my nostrils to get all these scents. CES: Look around the world for such a concentration of excellent butcheries, bakeries, wine shops, pastry shops, and fresh markets… New York might be number one for restaurants, but Paris is a step ahead for fresh food to bring back home. CES: We keep building People and Wine step by step. I want to give people more unique experiences around wine. We already offer concepts about wine and gems, wine and perfumes, wine and arts, wine and chocolate… with the best brands in their own field, and we want to keep that on. We also want to offer travellers (especially from the U.S.) the chance to discover the vineyards in an exclusive format, meeting top producers and enjoying rare moments. Moreover, we are working on innovative wine apps to help the consumers to make a choice in retail shops. Last but not least, we want to expand our services in investment-grade wines for investors, collectors and amateurs. Contact us if you have a project in the U.S. or anywhere else! 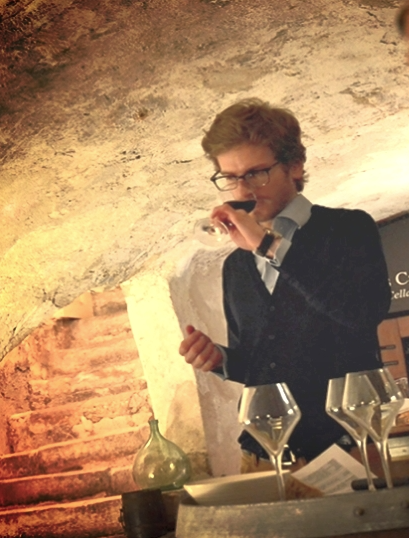 Part One: Wine in France: Charles-Erwan Savary, Champagne Ambassador to France, wine educator, and founder of “People and Wine” (part one), published on A Woman’s Paris®. Dorie Greenspan’s “Baking Chez Moi” proves that there are no frontiers when it comes to goodness (excerpt & recipes). A “culinary guru” and author of the award-winning Around my French Table and Baking: From My Home to Yours, Dorie Greenspan returns with an exciting collection of simple desserts from French home cooks and chefs. Baking Chez Moi is the culmination of all of Dorie’s discoverigs, and irristible collection of radically simple desserts inspired by years of travel through France, incorporating the country’s traditions, specialties, and seasonal ingredients as well as the recipes shared by talented home bakers and pastry chefs. Including recipes for Double-Chocolate Marble Cake, Edouard’s Chocolate Chip Cookies, and Green Tea Sablés. Leave a reply on "Wine in France: Charles-Erwan Savary on exceptional food pairings with Champagne and sparkling wine (part two)"